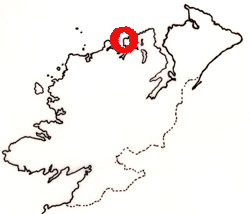 Dough Bay is in the far north of Donegal on the famous 'Atlantic Drive'. The shot is taken looking across the bay with Horn Head in the distance. It's a windy day in February, just compare the height of the waves with the houses on the edge of the bay.